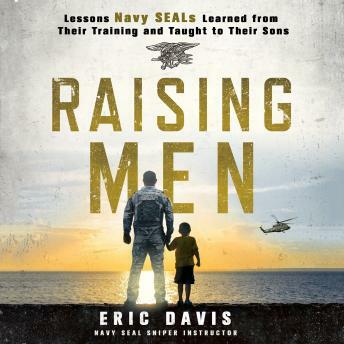 Navy SEAL sniper instructor Eric Davis applies his discipline techniques to raising his son in this incredible audiobook, Raising Men: Lessons Navy SEALs Learned from Their Training and Taught to Their Sons. After Eric Davis spent over sixteen years in the military, including a decade in the SEAL teams, his family was more than used to his absence on deployments and secret missions that could obscure his whereabouts for months at a time. Without a father figure in his own life since the age of fifteen, Eric was desperate to maintain the bonds he'd fought so hard to forge when his children were young--particularly with his son, Jason, because he knew how difficult it was to face the challenge of becoming a man on one's own. Unfortunately Eric learned the hard way that quality time doesn't always show up in quantity time. Facebook, television, phones, video games, school, jobs, friends--they all got in the way of a real, meaningful father-son relationship. It was time to take action. Using a unique blend of discipline, leadership, adventure, and grace, Eric and his SEAL brothers will teach you how to connect and reconnect with your sons and learn how to raise real men--the Navy SEAL way. The book hardly addresses raising men and more about the authors experiences in the Navy as a SEAL. His examples of good moments as a father are horrible, backed my nothing more than his opinion. The narrator sounds as smug as the author. Awesome content! I prefer to read, but this is great when on trips to the coast and my family are all doing their own things. Great book! Narration is good reminds me of the movie trailer guy who says, "in a world where..." Kind of humorous hearing narrator read some parts. Think I might buy a paper copy of this book too, just to re-read and make notes on the end of the chapter self-questions. Really entertaining special ops stories and surprisingly deep analysis of what it means to be a man and raise one (or just raising a family in general) love the "brass tax" method he uses to relay the truths from anecdotes that give you a reality check and left me wondering why I hadn't made that connection before. Well done sir.